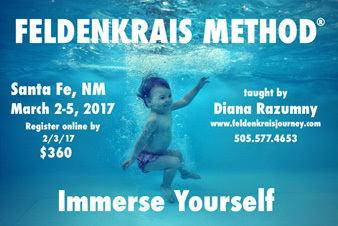 These 12 Awareness Through Movement® lessons were taught live in a 4-day workshop entitled Immersion in the Feldenkrais Method® taught by Diana Razumny in Santa Fe NM in March of 2017. This series of lessons encouraged a strong connection with self using the tools of imagination and breath. There is a strong theme of the Self Image, including students reading a lecture by Moshe Feldenkrais on the topic (not included). It can be found in the Alexander Yanai lesson #303. Along with self-image comes the minor themes of the face and lines. These lessons may be challenging for the novice, although those new to the method during this workshop experienced powerful results. For those of you seasoned in ATM lessons will likely find them deep and delicious. *The discussions and visual presentations were removed to create an easy format for doing this ATM series. Because of the live nature of the recordings you will occasionally hear a discussion reference. Designed to be done in order for the first time around. and Awareness Through Movement® are registered service marks of the Feldenkrais Guild of North America. ©2013-2019, Movement Educators; all rights reserved.